Dopamine-beta-hydroxylase (DBH) enzyme activity is modulated at the genetic level by the presence of several polymorphisms. Among these, the 19-bp insertion/deletion (I/D) polymorphism (rs72393728/rs141116007) was investigated in several genetic association studies for its correlation with the susceptibility to develop episodic migraine, but conflicting results were achieved. In the present study we analyzed this genetic variant in a carefully characterized population of migraineurs encompassing both episodic and chronic migraine (with and without medication overuse) with the aim to perform a replication study and verify any possible correlation with migraine endophenotypes. Genotyping of the DBH 19-bp I/D polymorphism was performed on 400 migraine patients and 204 healthy individuals. The associations between genotypic frequencies and the clinical and sociodemographic features of migraineurs were then investigated. 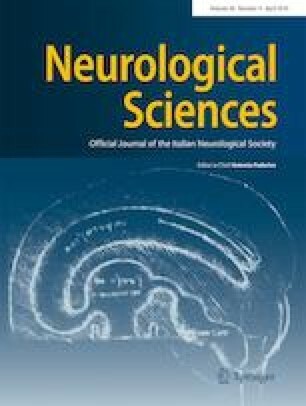 The DBH 19-bp I/D polymorphism did not correlate with migraine susceptibility or most clinical variables, with the exception of a statistically significant correlation within the subgroup of patients affected by chronic migraine were the individuals carrying the deleted (D) allele were significantly more prone to abuse in analgesics. As a result of this finding, the DBH 19-bp I/D polymorphism does not influence migraine susceptibility, but it might contribute to the development of medication overuse in patient with chronic migraine. Piero Barbanti and Fiorella Guadagni contributed equally to this work. This study was partially supported by the Associazione per la Ricerca Biomolecolare Organizzazione Non Lucrativa di Utilità Sociale (A.R.B. ONLUS) (https://www.facebook.com/Associazione-Ricerca-Biomolecolare-ONLUS-113232615514015/) and by the European Social Fund, under the Italian Ministry of Education, University and Research (PNR 2015-2020 ARS01_01163 PerMedNet—CUP B66G18000220005). MLDM and DL carried out the molecular genetic studies, participated in the molecular analysis, and drafted the manuscript. PB and RP conceived of the study, participated in its design and coordination, and helped to draft the manuscript. GE, LF, CA, and PB participated in patient’s recruitment. CI collected and interpreted the data and performed statistical analysis. DDM, PF, and FG conceptualized and designed the study, revised the manuscript, and approved the final manuscript as submitted. All authors read and approved the final manuscript. P. Barbanti has received consultancy fees from Allergan, Bayer, electroCore, and Visupharma, and advisory fees from Abbott and Merck. M.L. De Marchis, C. Ialongo, G. Egeo, L. Fofi, C. Aurilia, D. Lovero, D. Della-Morte, P. Ferroni, F. Guadagni, and R. Palmirotta report no disclosures relevant to the manuscript. The study was approved by the institutional Ethics Committee of San Raffaele Scientific Institute IRCCS and the patients gave written consent to participate. Part of the dataset supporting the conclusions of this article is available on request to the corresponding author.